The main character, Connie Goodwin, is working to get her doctorate at Harvard. As she looks for a topic on for her dissertation her mother asks her to clean out her grandmother’s old home. She finds strange jars full of things, an old bible with a key and the name Deliverance Dane. 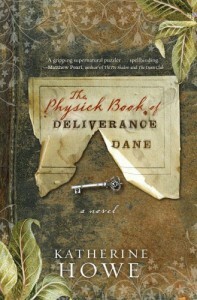 Her curiosity to find out more about Deliverance Dane leads her to a recipe book and Deliverance’s connection to the Salem witch trials. It took me a little bit to fall into this book because of the times it switched back to characters that spoke with boston accents or flashing back to puritan times accents. I could not make out what they were exactly saying sometimes. Once I did connect with the book I begin to love the characters and eventually the magic that joined them all together. My main dislike is it was to easy to see where the story was going, and who the bad guy was. There was also some dumb plots points where I felt smarter than Connie. For one she is in search of Deliverance’s book and does not realize that the different names the book may have as she searches for it. I was practically screaming at Connie, “She is calling the book an almanac now! Look for almanac now!” There were so many chapters until she realized just that.. I really did like the characters in the book and way magic is described. I read recently that the author Katherine Howe is writing a sequel. I am excited for it because even with the downfalls of the book I still enjoyed it very much.